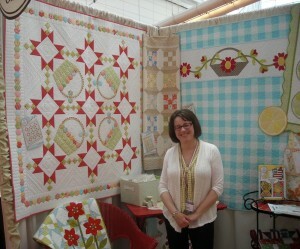 Well, Spring Quilt Market has been over for two weeks already! I haven’t even had time to sit down and tell you all about it. 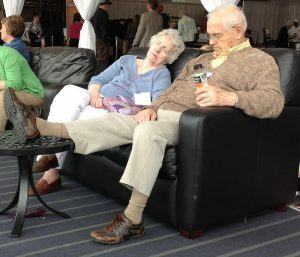 This year, it was held in Pittsburgh, PA. The Spring Market moves around every year, while the Fall Market is always held in Houston, TX. Quilt Market gives me a chance to meet up and visit with all my friends in the industry, plus conduct business in person regarding things I have coming up. Email and phone are great, but sometimes, that face-to-face meeting and a real-life conversation really helps. Another good thing about Market is that I get to meet and make new friends, and see all the new things that are coming out. It helps me to know what the current trends are (even if I never follow them), see new tools and gadgets demonstrated, and learn about new products. 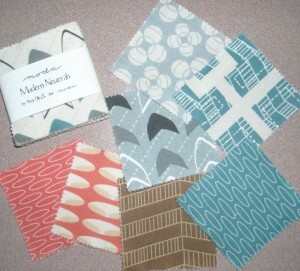 And of course, look at new fabric! Read on, and I’ll introduce you to a few of the people I got to see and meet this year, and some of the things that caught my eye. 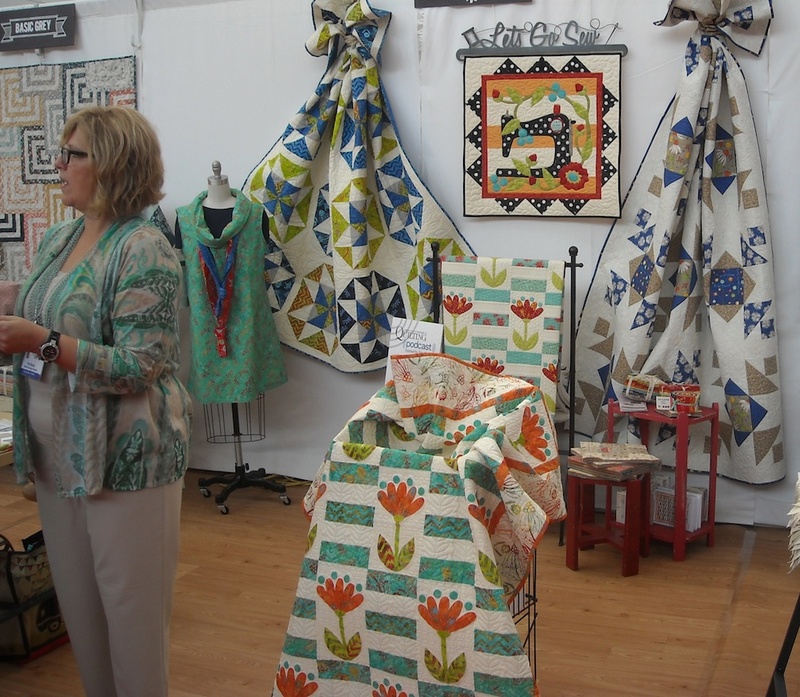 Of course, I had to go around and visit all the quilts that I had quilted for other designers. The first one I ran across was “Sunday’s Best”, hanging in The Gingham Girls booth. 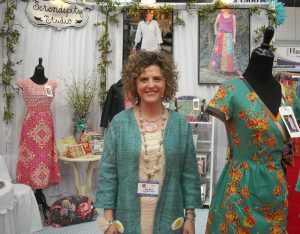 Ann Weber was actually in the booth at the time, and so was her sister, Joanne Rowicki, so I got to meet them both! Such sweet ladies. And I love their patterns. Their booth was such a happy cheery place. 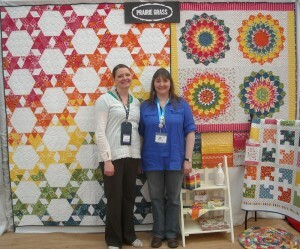 You really need to visit their website HERE to see all the new patterns they introduced at this Market. And see if you can spot the gingham! And if you’re interested in “Sunday’s Best”, you can find it right HERE. I also had to visit Pat Sloan. I can’t let a Market go by without seeing her and her shipping department! Pat had stuff all over the place. 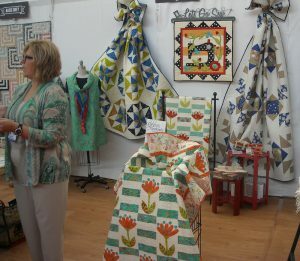 Here is a shot of her booth, while she’s busy talking to a customer: I quilted at least 3 of the quilts in this picture. Pat sure makes a lot of quilts! These are her newest patterns. And Pat’s sewing machine pattern has finally been released. 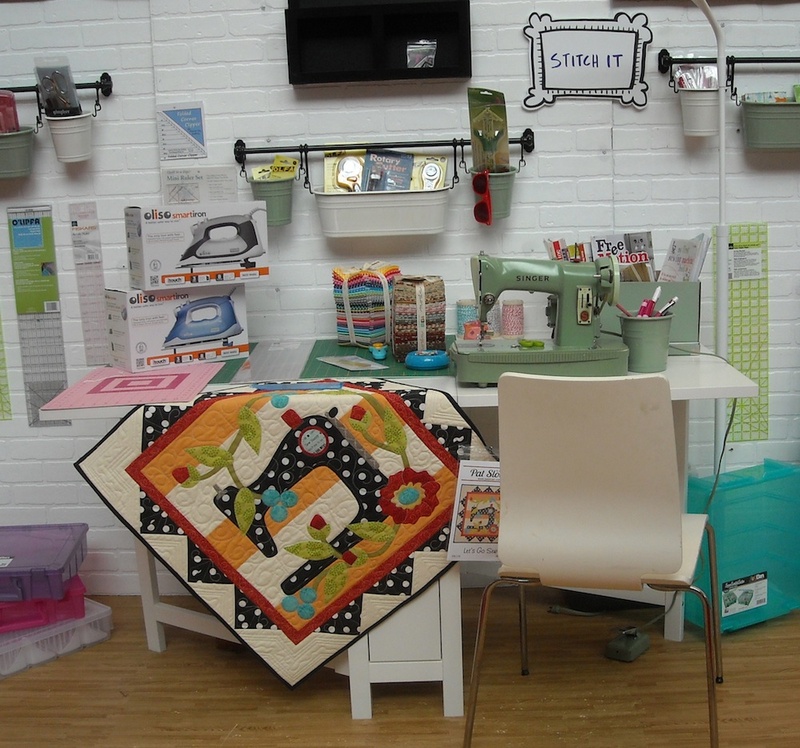 Quilters have been clamoring for this pattern ever since she first showed a sneak peek. 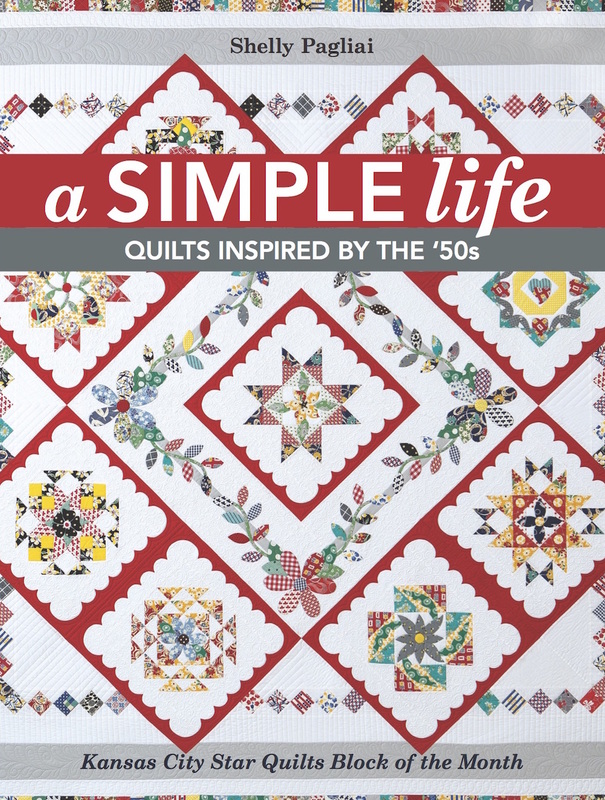 So ask at your local quilt shop, and they can get it for you. I always go visit the Dear Stella booth and visit the projects I made for them. This year, I made several projects using their Ludlow line, including the Sugar Stars quilt and four of the cutest little purses (hanging at lower right — made from patterns in the book, Liberty Love, by Alexia Abegg). 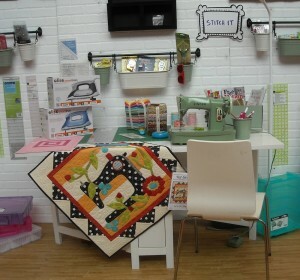 I also made two baby quilts using their Seaworthy line by Jack & Lulu. You can see them hanging at the top of this picture. There’s a boy version and a girl version, and the fabrics are just too cute — mermaids, whales, and pink seahorses — irresistible! 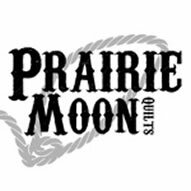 I also stopped by to visit April Rosenthal, of Prairie Grass Patterns, and congratulate her on her new fabric line with Moda. It is fabulous! Her line is called “Best. Day. Ever!”, and her new patterns are great. 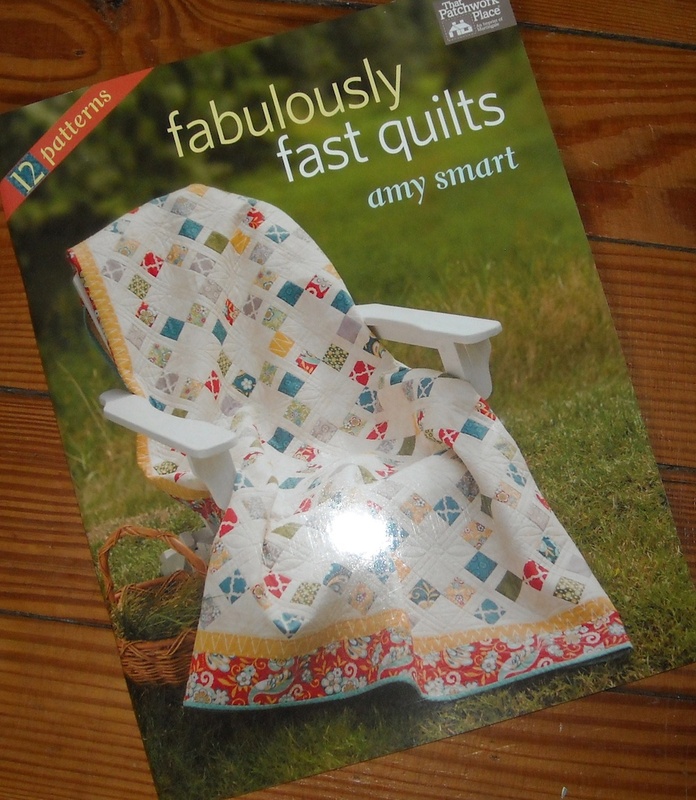 April’s patterns are all wonderful. Go visit her. My new favorite is “Dahlia”, which you can see in the upper right of this picture. I might have to make one of those! 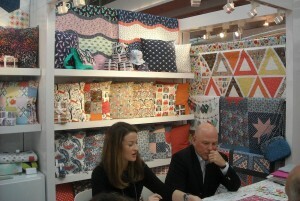 And right next to her was Amy Ellis, also with a new fabric line for Moda. 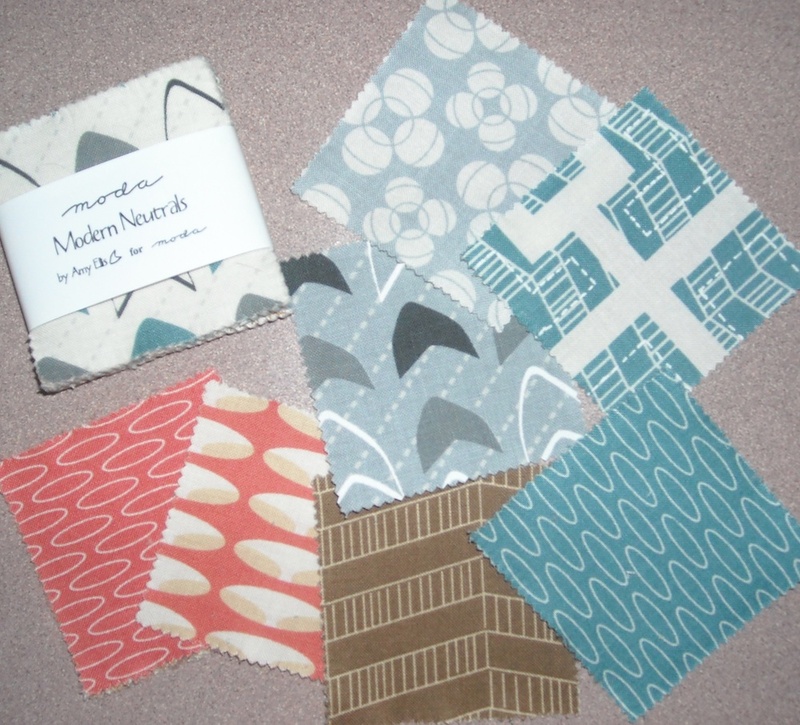 Amy’s line is called “Modern Neutrals”, and here’s a peek at it. 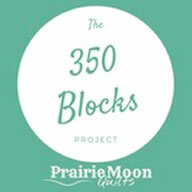 I’m excited to use my candy pack to make something! 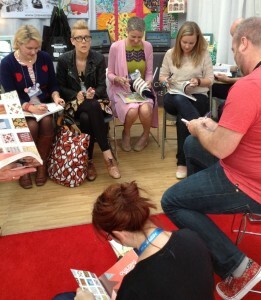 I attended a book signing that Victoria was a part of. 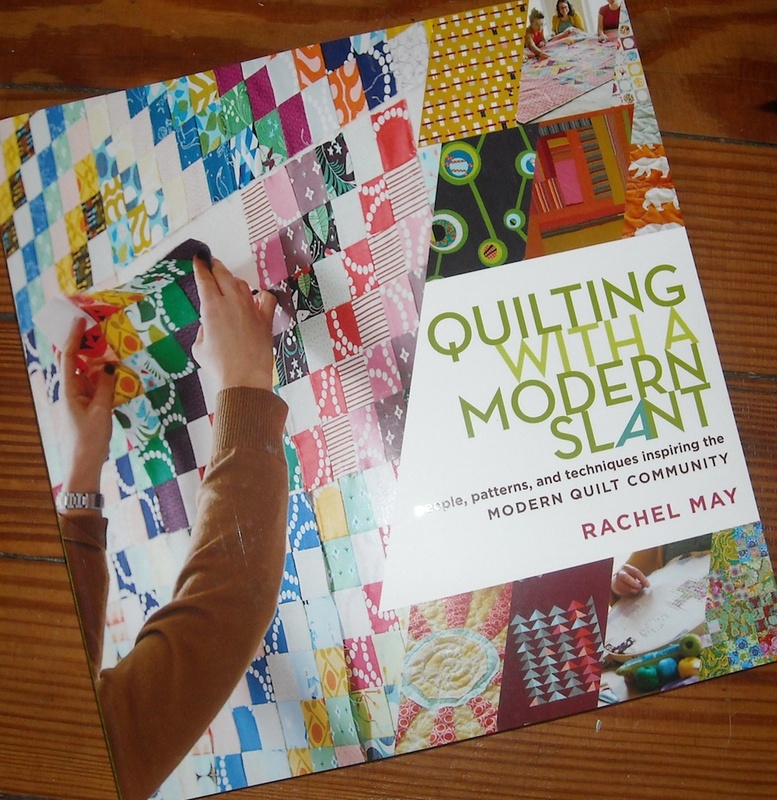 The book is a collaboration effort put together by Rachel May, and contains projects by many popular designers. There were a few of them in attendance at the signing, so I got my book autographed! Here’s the book. It’s called “Quilting With a Modern Slant”. You might wanna get a copy — it has lots of projects in it, and tons of inspiration, so it’s a good bargain. I’ve been shopping for a good skirt pattern for over a year, and have kept being too chicken to actually buy one, but at Market I met this cute little spitfire from Texas, Kay Whitt, from Serendipity Studio. Her designs are beautiful, and each pattern has lots of options. I not only found a skirt pattern, but I picked up one for a tunic as well. I’ll have to let you know if I get up enough nerve to actually make myself something! I also got to meet Mandy Leins, someone I’ve wanted to meet for a long time now. She’s a fellow longarm quilter who does fabulous work. There’s no photographic evidence of that meeting, but I think we’re gonna be good friends! There’s a lot to see at Market, and this is just a sprinkling of it. It’s quite exhausting, really. Other folks apparently thought so, too! And we’ll do it all again in the fall at Houston! Shelly, you know it! It was so great to meet you in person, and I feel lucky we’re friends! Looks like you had a great time. Love that skirt pattern, you need to get that made up so I can see it in person. 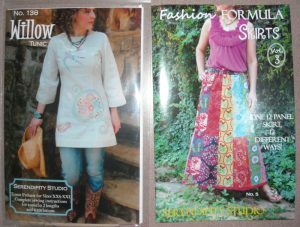 Don’t know where I will hang it, but I sew want that sewing machine pattern of Pat Sloan’S. Great recap! Every one I have read is totally different. It is like seeing market through 50 sets of eyes! Thanks! A skirt?! 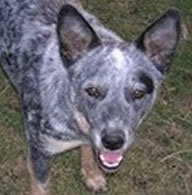 Now that I would love to have and it would have to be long!